Being well informed about the latest changes affecting our daily routines is essential to optimise fleets’ and drivers’ resources and work. 2019 has brought many modifications that have already been implemented and that are going to be explained in this article. The companies will be provided with data regarding the penalty points of hired drivers. The express consent of workers for their penalty points to be known is, therefore, withdrawn. Higher penalty for the use of mobile phones while driving. While the penalty imposed used to be of three points, now it has been doubled, sanctioning those using their phones with six penalty points. The amount to be paid remains the same, though, EUR 200. Thus, this penalty is put on the same level as that for reckless driving, driving under the influence of drugs or doubling the maximum permitted blood alcohol content, among other. Higher fines for exceeding the speed limit. Since last 2 January, driving at 80 km/hour in roads limited to 30 km/hour will entail a fine of EUR 500 and six penalty points, and will be considered as a serious infringement. Since the same date, the speed limit in secondary roads is reduced 10 km/hour, setting the maximum speed at 90 km/hour, 80km/hour for lorries, buses and vans. Not using a seatbelt will be sanctioned with four penalty points, one more than before the change in legislation. The transport sector is at its peak. And proof of this are the figures provided by ANIACAM (Spanish National Association of Car, Lorry, Bus and Motorbike Importers) that show that 2018 was a year of persistent growth in the commercial and industrial vehicle market. The number of registered vehicles increased up to 3.2% in the European market. And while countries like Italy (-4.1%) and United Kingdom (-1.9%) reduced their demand, the Spanish market accounted for a more beneficial figure (+6.5%), as it was the case with Germany (+4.6%) and France (+4.9%). Thus, Spain becomes the main standard-bearer in a sector that once again has proved that it has a lot to offer. And not only that, the beginning of the year has brought encouraging figures about. Although we were talking about a significant increase regarding the previous year, the month of January 2019 alone has revealed impressive data: the number of lorries registered in Spain has increased in 11.8%, accounting for a total amount of 2,542, to be more precise. Moreover, of all commercial vehicles, those that have increased to a larger extent regarding the number of vehicles registered in the first month have been heavy goods vehicles of more than 16 tonnes. 2,152 units were registered, accounting for an increase of 12.2%. These figures predict, indeed, a good year for the transport sector that continues aiming high. Data do not lie, and the fact that 2018 was the sixth consecutive year in which the number of commercial vehicles registered continued to grow proves that the sector is ready for whatever may come. There is no doubt that the future will bring new challenges to be faced by this sector. But it is clear that it is ready to confront them with no fear at all. Following the launching of the Corporate Social Responsibility plan #WeLookAfterWhatMatters, which aims at providing added value to and taking good care of drivers, we have started the month of February with specific actions to help lorry drivers follow a healthy diet. In addition to posting nutritional tips on our social media profiles, these actions also involve offering our customers fruit corners for free in all our service stations from today until the 1st of March. With this action, which is part of our Corporate Social Responsibility plan, we wish to challenge a problem that lorry drivers usually encounter: following a healthy diet while driving. If we add this to the number of hours that drivers spend sitting while working, the result is that there are many health problems that can affect their health. With this plan, we wish to fight against overweight, cholesterol or cardiovascular problems. With #WeLookAfterWhatMatters we intend to take care of drivers enabling them to work out, get some rest, have a good time, follow a healthy diet and focus on driving ergonomics. This is the second special action of this campaign following the opening of the Andamur La Junquera gym, and in the months to come we will continue carrying out new actions with the same aim in mind. Stay alert! In spite of the fact that lorry drivers spend hours and hours driving, sometimes they do not enjoy the best resting conditions. But innovation in this sector is starting to speed up and a growing number of cabins offer multiple advantages for professional drivers to feel at home. Spacious cabins, with more and more customisable features, offering maximum comfort in the resting area. These are conceived to improve driver’s experience and habitability. Cabin access panel. Located near the bed, it gives access to the cabin lights, sliding roof, power windows and central locking system. There is also an alarm clock and USB access, without leaving the bunk bed. Sound isolation systems. They play a really important role: they reduce noise to about 30% and ensure greater peace inside the cabin. Cooling systems while parked. They have the ability to keep the inside of the cabin at the desired temperature throughout the night to provide greater rest. Electric drying wardrobe. This is exactly as it sounds. If you need to dry your clothes, towels or shoes quickly, you can do so with this quiet system. You can put it away easily; it takes up very little space and consumes little energy. Air quality sensors. Thanks to the filters they have, the air is purified before reaching your lungs. Thus, currents are eliminated and greater quality air is produced with this system. Energy-saving lighting. Completely customisable, it adapts to drivers’ preferences during working and resting hours. The transport sector is going through a good time. Although it represents 2.9% of the national GDP, 2018 finished with a promising growth figure: the world freight transport market grew 4.1%. The new consumption models are demanding that we adapt to the new needs of international trade, to a larger stock rotation and an increase in transport services. And it looks like the sector is doing well. But the swiftness of the market forces us to remain vigilant. The sector will intensify its efforts to reduce its environmental impact, generating further commitment and responsibility. In addition, efficient resource management will be essential. Liquefied natural gas (LNG) vehicles will gradually become more important compared to those using traditional fuel, since they bring about many advantages to be taken into account. Technology will burst into the sector. In an increasingly digitalised environment, the transport sector will evolve towards important changes both in roads and warehouses. The customer will remain at the centre. Although this trend was observed some years ago, as time goes by, the customer has become more demanding, so the sector must be offering more and more. In order for the transport sector to continue accounting for the good figures it represents now, fostering the opportunities offered by technology and their adaptation to the market is essential. Andamur continues working to fulfil its commitment to growth by offering its customers new stations. For this reason, as of today, our users have two more associated stations in strategic locations in order to improve and continue fostering professional transport. These two new stations are located in Villanueva del Rey (Seville) and Beneixida (Valencia). The first one offers users around the clock service, shop, restaurant and Diesel A fuelling. As for the second one, it offers around the clock service, showers, fax, shop, Diesel A, Diesel B and Adblue. They both offer the quality, security and service guarantee provided by Andamur in all its service areas. 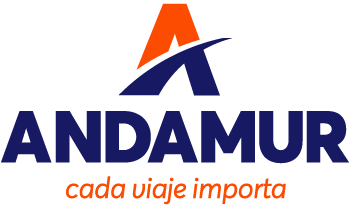 With these two new stations, Andamur reaches a total of 20 service stations located in the Spanish territory and more than 170 within its international network. All of them connect with the main European roads and routes. At Andamur, we continue growing always focusing on making drivers’ lives easier: contributing improvements and comfort to the transport sector while working on offering drivers solutions to their needs. This way, we continue growing both at a national and international level. The lorry, your loyal travelling companion who travels with you for thousands and thousands of miles, is sometimes the first one to be affected by your state of mind. Because this is directly related to the way you drive. Stress is the main cause of physical and emotional strain on industrial vehicle drivers. According to available data, 76% of drivers are stressed out while driving. A significantly high percentage that triggers situations of risk and that causes impulsiveness, impatience and even aggressiveness on the driver while driving. And the worst thing is that stress makes you have a lower risk perception. Healthy lifestyle. Be aware of the importance of having a good diet, resting for the necessary hours and avoiding the road when necessary. It may sound like a cliché, but health comes first. Plan your routine in advance. It is essential to be flexible with your schedule and not to stick to a timeline in a very strict way, since unexpected circumstances may arise and cause stress. You have to accept that there might be setbacks and you need to adapt to them. Prioritise your aims. You need to identify the most important parts of your routine and set yourself objectives to carry them out. Embrace your daily plan and follow it in an organised way, this will help you reduce your stress level. Music, your best ally. Enjoy your favourite songs while driving; these have a strong power over your state of mind. Having a good state of mind and getting rid of stress in your routine will enable you, your family and your loyal travelling companion to feel more relaxed. Caution on wet roads. The rain makes tyres lose grip on the road, so it would be convenient to increase the safety distance with the car in front of you and reduce your speed. If it starts raining very intensely, you are recommended to turn on your headlights or even your fog lights if it starts raining more heavily to increase visibility. Strengthening these recommendations in case of fog or snow is a key factor to be borne in mind when visibility is reduced. Careful with the first raindrops. The first raindrops are also dangerous, since they mix up with materials and substances on the road surface creating an extremely slippery coating. Doubling your braking distance will contribute to your safety. Anticipation. Remain vigilant at all times, especially with adverse weather conditions. Observe your surroundings very carefully looking into the forward road-scene as further away as possible to widen your field of vision, this will enable you to “see without looking”, increasing your peripheral vision. In addition, we recommend you check the weather forecast for the route you are going to follow. Get your driving compartment ready. Driving comfortably has a bigger impact than one might think. The ideal temperature in your driving compartment should be 20º-22º, both in summer and in winter. A higher temperature could make you feel sleepy and tired, reducing your response capability.